Metro, the free tabloid distributed on Center CIty sidewalks and mass transit stations, laid off three of its last four general news reporters in Philadelphia on Tuesday, sources said. Metro — the free tabloid distributed at SEPTA stations and Center City sidewalks — has eliminated the jobs of three of its last four general news staffers, sources said. The cutbacks, disclosed Tuesday to staff members in phone calls from New York, stunned the Metro employees in Philadelphia, who were told only last month that a new executive team wouldn’t be focusing on digital clicks but would seek, rather, to rejuvenate the tabloids popular with train and bus riders, sources said. Metro also publishes tabloids in Boston and New York, and reporters there have tweeted that they lost jobs. Eva Kis in New York tweeted on Tuesday that “most” of the reporters were let go. "An incredible ride,” she said. A top Metro executive at the company’s headquarters did not respond to an email. Three journalists were let go in Philadelphia, leaving one still on staff. Those terminated were reporters Michael Butler and Sam Newhouse, and sports editor Jovan Alford. The Metro is continuing to publish and may use shared content from other Metros, wire service stories, and content sponsored by advertisers. 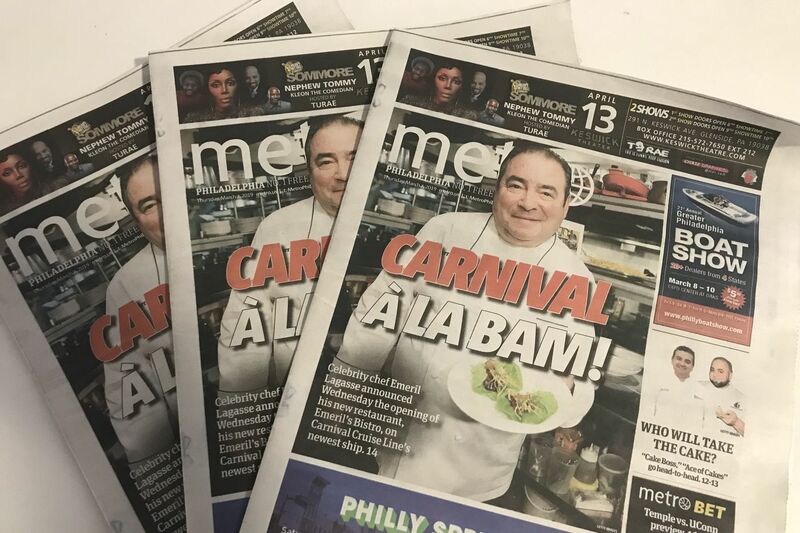 A cover story of celebrity chef Emeril Lagasse opening his new restaurant on Carnival Cruise Line, written by a Metro staffer in New York, graced the cover of Thursday’s Metro in Philadelphia. Butler, 31, was hired in January after freelancing for a couple years. He expected to have a conference call editorial news meeting with Boston and New York. He instead got a phone call from an editor on Tuesday, laying him off. The Metro’s offices, in the 2400 block of Walnut Street, also include a sales staff. Michael Butler was hired at Metro earlier this year. His job at the free tabloid was terminated Tuesday. “I was shocked,” Butler said, noting that “there is not a lot of local press in Philadelphia. Life happens. We’re reporters. So let’s talk about it.” Butler said he will return to freelancing. Metro’s travails are indicative of the financial stress on local news. On Wednesday, Spirited Media disclosed that it was seeking buyers for the Billy Penn local online news site in Philadelphia — which had attracted funding from the newspaper chain Gannett and others — and a sister online site in Pittsburgh, TheIncline. Spirited Media has sold its Denverite online news site to Colorado Public Radio. Beyond Billy Penn and the Metro, the Courier-Post in Cherry Hill and the News Journal in Wilmington, both owned by the Gannett chain, face uncertainty. The hedge fund-controlled Digital First Media, which cuts newspaper operations to the bone to boost profits, has made an unsolicited bid for Gannett.